I suppose I've attacked the Olympics enough recently. Time to attack something else. The Biking Borough of Brent? Why not. Brent Council has been awarded a framed Team GB cycling shirt in recognition of their efforts to get residents on their bikes. The kit, similar to those worn by British riders in the London 2012 Olympic Games and Paralympic Games, has been handed to town hall bosses for providing a series of free guided rides in the borough throughout the summer. British Cycling, who made the award, teamed up with the council and Sky to offer ‘Sky Rides’ to beginners and cyclists who are out of the habit. If you’ve not been on a bike for a while don’t worry, our friendly and experienced ride leaders are there to help and support you. We want more people to get on their bikes in Brent and what better way to start than in this fantastic year for sport and cycling. So "cycling" in this Olympic year becomes more than ever identified with a sports activity. One thing that is wrong with this is, of course, that, even in Olympic London, there are, horror of horrors, many people, probably, at a guess, about half the population, who are not interested in sport at all. They are just putting up with all this Olympic nonsense, staying quietly in their houses, or they have gone to Scotland or somewhere. They will be back. An appeal to them to cycle, on the basis of its sportiness and fitness-giving qualities, will not work. These are the people who are least likely to cycle in the present sports-promotional climate, but who would perhaps benefit most from cycling. For others, a few, such appeals might work, for a while: for a month or two, or a few years. Enough for them to replace for a while the generation of cyclists who started in the almost car-free 1950s, and who are now dying or becoming incapable of cycling. Enough for them to replace the middle-aged cyclists who finally throw in the towel and decide it is all too stressful. So we have what is known as "churn". The overall number of people cycling regularly doesn't change very much. The increase that we have seen in cycling in London in recent years in terms of miles cycled is largely accounted for by regular cyclists cycling more. And that increase has been much smaller than is often claimed: it's been about 50% in the last two decades (DfT data quoted on p31 of BMA Healthy transport study), not, as people keep claiming, a "doubling" or "tripling"of cycling in London. 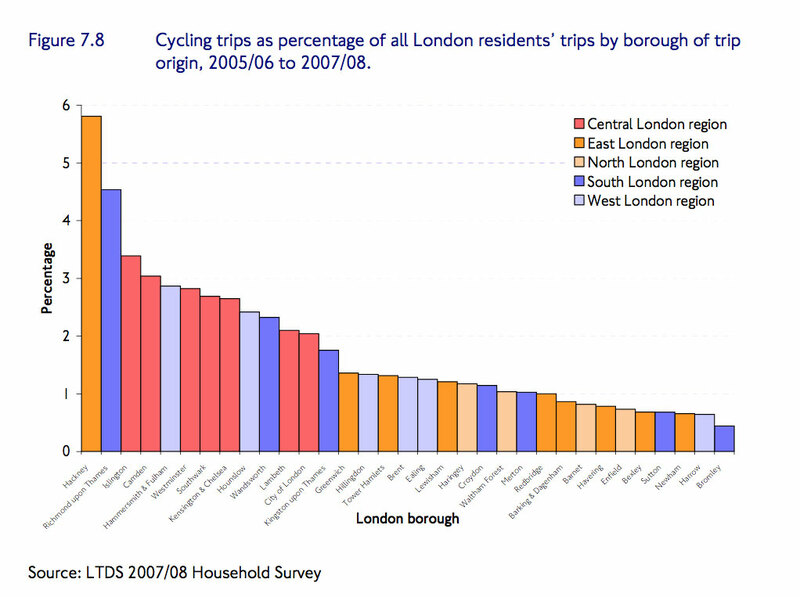 Other surveys show us that amongst some significant communities in London, 90% say they never cycle. The Olympics, and in particular, Team GB's success on the cycle track and in the road races, inspires a lot of people to a counter-experiential faith in how normal, everyday cycling on our roads might change as a result afterwards. For myself, I don't see much of a connection between the condition of the sport and conditions on the roads and paths for utility cycling. The success of Lance Armstrong in the Tour de France never did anything for utility cycling in the USA, so far as I can see. The same goes for all the French cycle racers who ever did well; utility cycling is at almost as absymal a level in France as it is in the UK. The driving out of traffic of central London by the Olympics has has a good effect on cycling, but I am sure it will be temporary. We will be back to normal soon. Conditions will be back to where they were, unless they are deliberately changed through decisions by politicians, and cycling levels, which are a consequence of those conditions, as well as of "push" factors, such as the cost of public transport, will return to what they were. It's the difference between cycling hell and cycling heaven. Again, cycling hell versus cycling heaven. Again, it's making the cycling environment delightful as against making it nasty and stressful. I bet my bottom dollar that will never get cycling in Brent, and similar urban areas in the UK, beyond the two or three percent modal share unless these street scenes that you see here are transformed in the direction that the Dutch show us. And only decisions taken by politicians can achieve that, not anything any athlete can do, not anything any business can do, not anything any social movement or trend can do, on its own. I'm not sure where this is – it could be London somewhere. There's a bike shop, a branch of Evans, on this street. There's a widened pavement with benches (that nobody is using), and there is fancy new paving, and there are new street trees, and there is heavy traffic, and there is no space for cycling. This is a type of picture you cannot take in the Netherlands. Streets there simply do not look like this any more. After at least 40 years of planning to make it so, Dutch roads now are either "roads for movement" (as in my picture of the "suburban main road" with the cycle track, above), or "streets", meaning, roads that are focussed around activities: commerce, learning, living. Such streets never now function to transmit large volumes of motor traffic. The combined commercial-living-walking-parking-cycling-bus-heavy-motor-through-route idea of a road, exemplified in the photo of Edgware Road, and the DfT's own photo, is gone in the Netherlands. And that's why its much better both to cycle and to drive in the Netherlands. So I'm certain that the physical characteristics of our streets have to change if we are ever to see a true cycling revolution in the UK. It's a planning matter. And who does planning in the UK? Largely, it's the councils, like the London Borough of Brent. I was therefore interested to see that Brent's "Highways Committee" (which looks after both its roads and streets – how antiquated the name they use for themselves seems in the context of this discussion) has recently discussed cycling. On 17 July they had an agenda item entitled Recent success and future direction of cycling in Brent. It's on the web. 1.1 Brent Council is a robust supporter of cycling as a healthy, cheap and environmentally sustainable form of transport. The sustainable transport team, based in the Council’s Highway & Transport Delivery Service, facilitates and manages the delivery of a broad range of measures which make it safer, easier and more attractive to cycle in the Borough. 1.2 Brent’s statutory transport plan – the Mayoral/Council approved “Local Implementation Plan” (LIP) 2011-2014 includes ambitious targets of almost doubling the number of trips made by bicycle over the next eight years. 1.3 This Report presents what the Council has recently achieved in relation to cycling, what it is doing now, and what it proposes to do in the future. It also presents the steps Brent is taking to support the London-wide and local targets and provides information as to recent successes in reducing the level of cycling-related casualties on the borough's highways network. - SAFETY: To ensure that cycle training and supporting cycling safety programmes such as “Bike It” are promoted and continue to be offered – for free – to anyone who lives, works or studies in Brent, so both new and experienced cyclists can cycle with more confidence. And the infrastructure strand doesn't sound very hopeful, if the prime example they can think of is parking. Parking is not infrastructure. Infrastructure is what you get around on. So it looks like the strategy to increase cycling from 1.3% mode share to 2.5% by 2020 (para 3.4) is at least 75% promotion and training. It doesn't sound hopeful. Well, maybe that 25% infrastructure will be very good, good enough to make a difference. 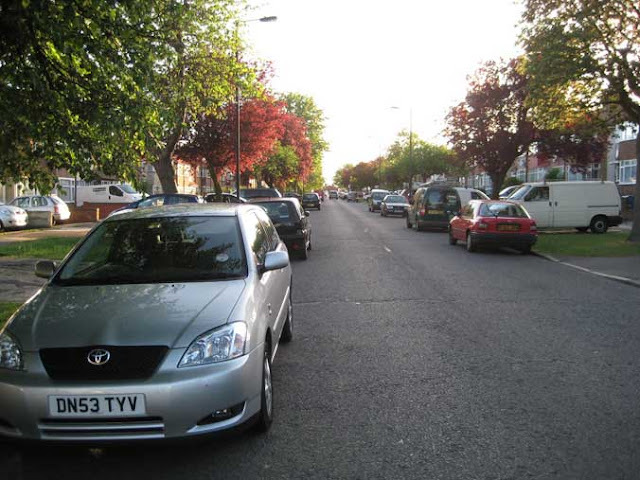 3.32 Creating safer streets remains the borough's utmost priority. However, we remain conscious that outer-London is a very different place to inner-London. This is no traffic-free "South Bank". 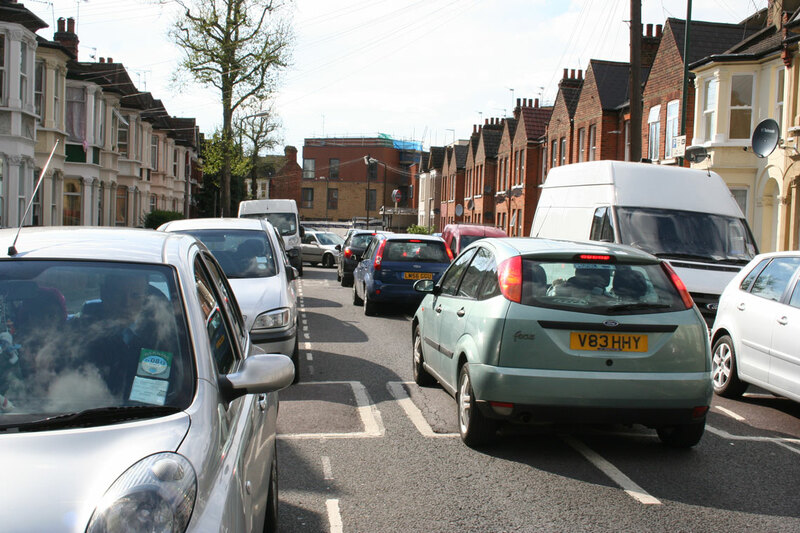 Brent has a population of over 260,000 people and some very busy - and hugely congested - roads spanning the borough. For example, the A5 and the A404 are part of the Transport for London Strategic Road Network, and very busy bus routes. This paragraph demonstrates, I think, that Brent's planners have given up on the idea of safe cycle infrastructure before they have started. Brent is "not inner London". Well, well, well, who would have thought it. Sorry, shouldn't that make it easier to create quality cycling infrastructure, not more difficult?? There is a lot more space available in outer than in inner London. The population density is lower. 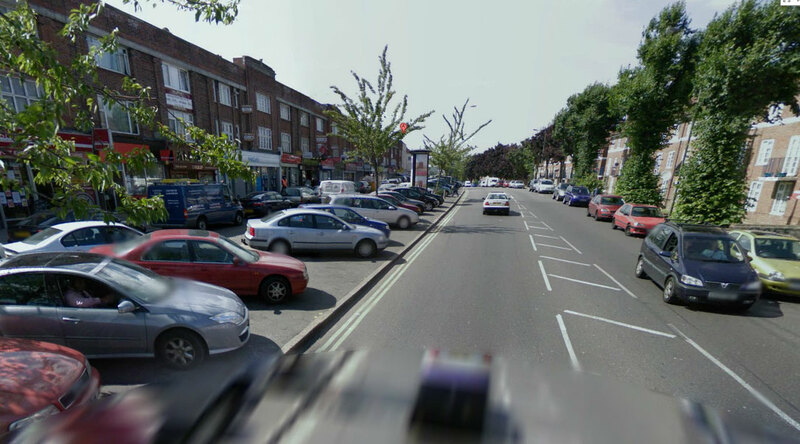 I have shown in my photos above how there is clearly enough space on the streets of Brent to create a "heaven" for cycling, if those streets were re-designed along Dutch lines. I don't know if they know what they are talking about, with their "traffic-free South Bank". Most of the South Bank is not a practical cycle route, cycling is banned there in critical places, and in other places it tends to be too crowded with pedestrians. There is a major problem with much of the land on the South Bank being private (e.g. outside County Hall), meaning that a continuous, legally-enforceable route cannot be created. The South Bank is in no way a good or relevant comparison for Brent. More relevant might be the Royal Parks of central London, where, at least in places, popular and decent cycle routes have been provided which do kind of link to the roads (well, in only one really, Hyde Park), while cycling on all paths in Brent parks remains banned by a bye-law dating from 1906. What para. 3.32 seems to be saying is that Brent Council cannot see how cyclists can be given their own space on its "busy – and hugely congested roads". With that attitude, their cycling strategy is certain to fail. It took political courage and determination for the Dutch (and the Danes) to change their roads from looking something very like Brent's do now, in the 1970s, to how they appear today. It wasn't very popular at first, 'till people saw the strategy working. That courage and determination, that vision, is completely absent in the UK's town halls. There are stirrings of it in France (a country I have already criticised in this post), where Paris's mayor wants to remove the motorways along both banks of the Seine that have blighted the city since the 1960s, and give those banks over to walkers and cyclists. We could have that on the north bank of the Thames in London, where the land is public (or on the south bank if we had a political system that could take on big commercial interests and compulsorily purchase critical plots of urban land for public environmental benefit), but that seems a million miles from Boris Johnson's agenda. Though there are exceptions, generally, boroughs that have seen the KSI increases are the high-cycling inner ones. It looks to me like there have been, over the period, bigger increases in cycling in the areas that were already relatively high-cycling areas, and hence more casualties, despite, probably, some increase in safety per mile cycled everywhere. In outer London, including Brent, the increases in cycling were so small, or negative, that they could not outweigh the modest safety improvement. 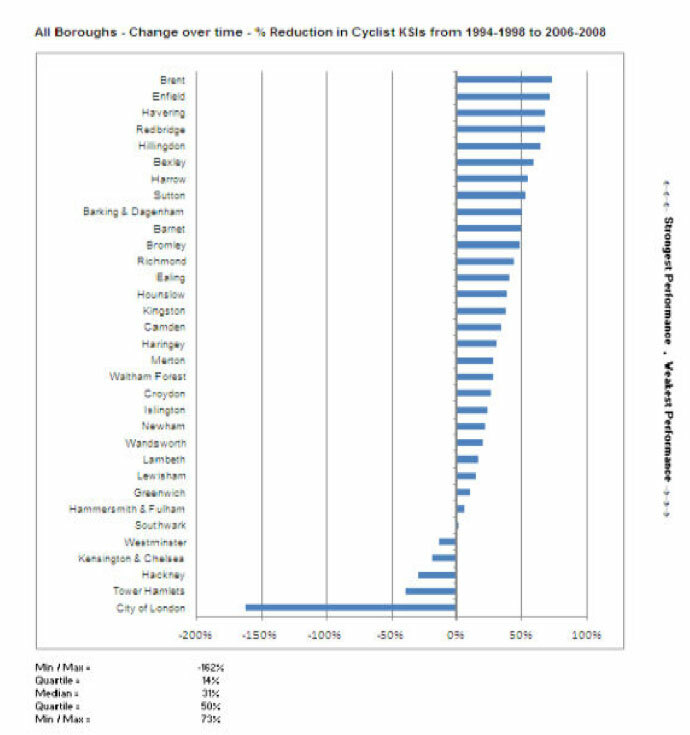 It looks like Brent came out top of this KSI analysis because the growth in cycling here was lower than anywhere else in London because of the terrible conditions. So there is really nothing for Brent to claim as success here. The overwhelmingly important fact remains that Brent's citizens are virtually all too scared to cycle on Brent's roads. I see in Brent Council's complacent, mis-focused, absurdly optimistic document no recognition of the real, all too brutally physical, nature of the problem, no realisation of the scale of the task, no real strategy for making the changes that would be needed to fulfil even their modest "cycle doubling in eight years" objective, most of all, no recognition of why, in truth, 98.7% of journeys in Brent are NOT made by bike now. There are no significant financial implications arising from this report. 3.13 Brent Council does not provide funding for promoting and facilitating increased levels of cycling in the borough, unlike highways aspects such as road maintenance. Officers spending time on cycling-related projects “recharge” their time to Transport for London funded projects, meaning even their salaries are essentially ‘subsidised’ for the time they spend on cycling issues and related initiatives. Cycling projects – particularly infrastructure specific projects, are also regularly funded by “Section 106” (local developer) contributions. Well, this is the bombshell, isn't it? Or at least it would be, to someone unacquainted with the ways of UK local government and sustainable transport. It means there's actually no money to actually change anything for cycling on the streets. There are bids to TfL (in the Local Implementation Plan) for the odd £100,000 here and there, but these are always schemes with multiple purpose, such as bus priority, or "streetscape improvements", "Corridor Bids" as they are called in the current jargon, with bit of cycling, perhaps a logo or two, a sign, some parking, or even a dropped kerb, tacked on. There is no budget for the kinds of changes that are really needed from any source, public or private. If the report was honest and ernest in its objectives, there certainly would be "financial implications arising from" it. Vast ones. To get cyclists safely and conveniently through that road system shown in my last picture would require infrastructure changes costing, almost certainly, several millions of pounds. And this is just one junction out of many junctions and roads that would need massively overhauling to make Brent truly a Biking Borough. The project just isn't serious, and anybody reading this Highways committee report, and then looking at the realities on the ground, that I have shown in a few representative pictures, and comparing them with the quality of infrastructure that has been shown to be necessary to achieve a mass cycling culture in other European countries, is able to see that. I'm sorry to be a pessimistic messenger again, and a none too diplomatic one, as I know the report must have been written by people with whom I have contact, and some of whom I know are good people who believe in the potential of cycling and try hard to put a case for it, within the resources available to them, but I think someone has to tell it like it is. Brent's cycling strategy, on its present conceptual and funding basis, will certainly fail. A last word (or two) on money. We seem to have got it into our collective heads in the UK that cycling infrastructure is "expensive", and promotion is "affordable". Hence the focus on promotion. But I argue all the money spent on promotion, without parallel infrastructure change, is money down the drain. It just sustains the cycling "churn". Quality infrastructure is expensive compared to PR initiatives, in the short term, "Nice things cost money" as Jim Davis puts it, but on a long long term analysis it would look different. David Hembrow tells us, from the Dutch perspective, that even the best cycling infrastructure in the world is not really expensive on the scale of other government expenditures. A level of expenditure of 30 euros per person per year, the Dutch level, about £20, equates to around one billion pounds for the UK. The UK's transport budget is £22 billion. For Brent's population, that level of expenditure would be £5.2 million per year. A new building is currently rising in Wembley. This is Brent's new Civic Centre, to replace the Town Hall and other council offices, scheduled for completion towards the end of this year. Brent is making a lot of the environmental credentials of this building – it will be the greenest in the UK, they claim. I have also heard Brent officers, ever optimistic, expressing hopes that lots of people working at, and visiting, the building will cycle there. I expect they will provide lots of cycle parking, consistent with their infrastructure strategy. I predict that will not work. It cannot, without a major transformative plan for cycle and walking connections for the whole area around Wembley, of which there is no sign (the 2007 Sustrans GOAL plan having gone nowhere). I expect the cycle parking to be little used. For Wembley is situated at an almost uniquely inaccessible choke point on London's road network, closely surrounded by railway lines whose only cycleable crossing points are a few very major, crowded, polluted, nasty roads, full of HGVs: Bridge Road, Forty Avenue, East Lane, Wembley Hill Road, Great Central Way, Park Lane, and Wembley High Road. 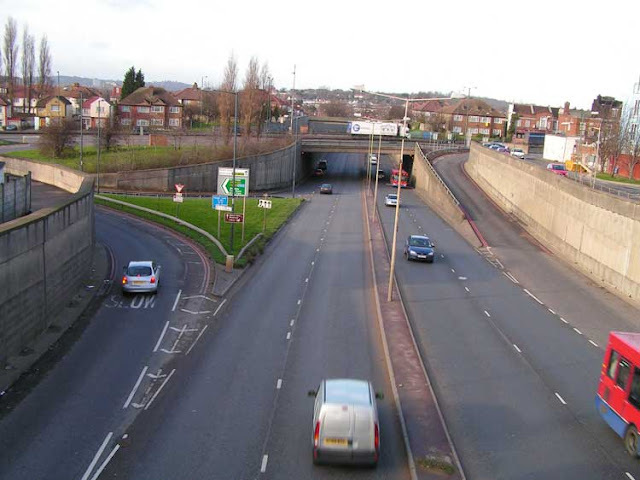 If this were not enough, the whole area is cut off from the south of the borough, where most of the population lives, by the North Circular Road, only crossable at Neasden (at the junction pictured above) or the slightly safer, but still deeply unpleasant, Harrow Road intersection. The Civic Centre will cost £100 million on current estimates. Brent is borrowing this money, to be repaid (with normal interest of course) by Council Tax payers over the coming years. It seems they can choose to borrow this sum of money to create a new working environment for the council, but not to create a cycle network. £100 million equates to nearly 20 years of expenditure on cycle infrastructure at the Dutch rate, long enough to totally transform the cycling (and walking) environment of this part of London, getting a large slice of the population choosing active and healthy travel options, and massively reducing motor vehicle use, with all the congestion, pollution and business benefits that would bring (for Brent currently has the worst air quality in London). The Civic Centre shows Brent Council can choose to spend serious money. Is it choosing the right things to spend on? I know what I would prefer them to do. The photo with Evans bike shop is The Cut looking west towards the old vic, it is exactly as you describe! Hellish to cycle along, and it shouldn't be, also the block paving used on the raised sections is deeply and dangerously sunken in places, due to inadequate foundation for the heavy vehicles using the road. Being dutch, i think you last picture is far more depressing than the ones at the start of your post. 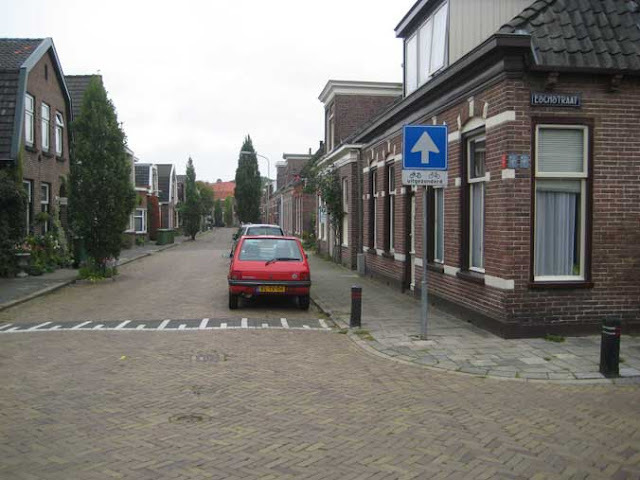 I could easily find streets in the Netherlands that are badly designed and even dangerous to bicycles. It's a minority nowadays, but street design has evolved over time, and some layouts just haven't changed since 1970 or so. Not really a problem, it's always avoidable by a very small detour, since over 90% of the roads have decent cycling facilities. However, most people don't care much. Cycle lanes are really important on crossings, and even more important when guiding you through major intersections. 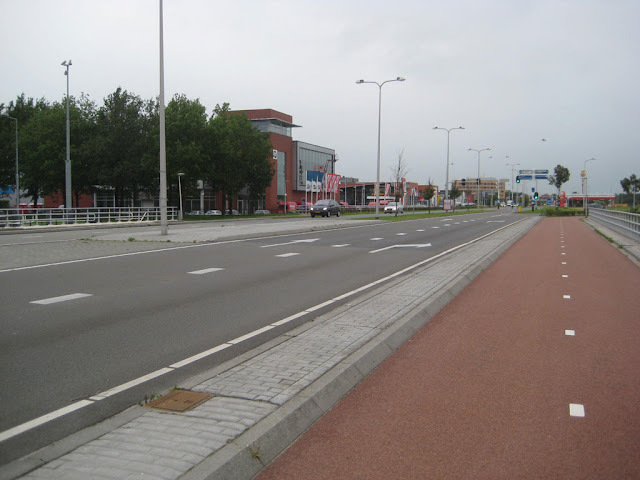 I'd rather have only cycle-provisions on the most difficult 10%, than nice cycle paths along all roads, to be left on your own when you come to an intersection like that. 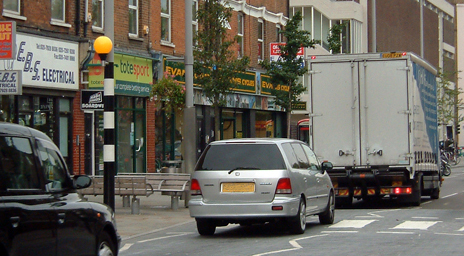 Yes, of course the places that need to be tacked first are the most dangerous junctions, like Neasden (which is now the second to last picture in the post, as I extended it). Tackling those alone (and there are a lot of them in London, far more than the 100 junctions currently being reviewed by TfL) and doing it well would probably get cycling in London above a 5% mode share level. 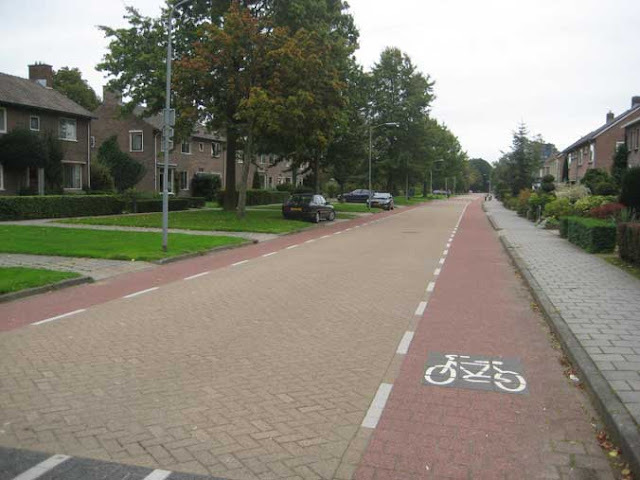 But I do believe that a continuously pleasant and stress-free cycling environment "door to door" is needed to get the vast majority of people cycling, and this is what the Dutch have come very close to fully achieving now. At first I thought David was exaggerating, but after playing around with Google Maps for a while it really does become obvious that that's the only crossing of the North Circular for miles. I can see why mass cycling isn't taking off in suburban London, imagine a parent letting their 8 year old kids (typical age for Dutch children to cycle to school unattended) cross that death trap to get to a friend's house, or to the lido, or to football practice... if I were a parent, I wouldn't let my kids onto a road like that until, well, until they were adults and I couldn't stop them any more. And when there are things like that making everday utility cycling impossible on certain routes, it's not going to be taken seriously as a mode of transport. Thank you for settling an argument, by the way. As a Dutchman, I was previously of the opinion that cycling in the UK was possible for a majority of people "if they kept their wits about them", as Boris put it. My British partner disagreed, and your example shows that for the majority of people - those of us who aren't fit, risk-taking young males - cycling ISN'T a viable option as an everyday pursuit. Ah, the lovely "where funding allows" get-out clause for failing to ever provide any decent infrastructure. And the requirement that cycling infrastructure, uniquely among modes of transport, has to make do with scraps of S106 planning bribe money. We get that a great deal in West Sussex too. How on earth do they think they're going to encourage more people to ride bicycles for local transport when the only mode of transport they ever invest in seriously is the source of all the danger to cyclists?